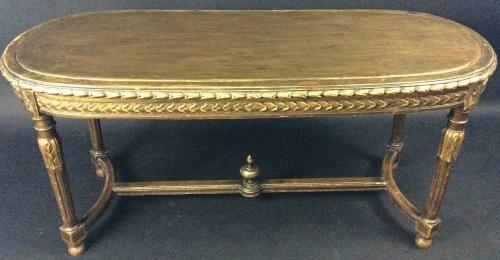 This is a Vintage - probably 1950s - oval table with Giltwood moulding showing style elements from the Louis XVI era. Judging from other more expensive examples that we have seen, it probably started life with a contemporary marble top. It came to us looking somewhat forlorn with a sad plain replacement top, which we have restored and regilded with liquid metal paint over traditional red oxide, to match the distressed original giltwood exactly. The giltwood and gesso of the carving has also been refilled and regilded in places. The result is a small, elegant occasional table on turned and reeded supports, with interesting stretchers, a handsome finial, and lovely gilded moulding, all in subtle distressed Regency gold shades. In a traditional Antique Interior, or a Vintage setting with Metallic tones, it can now hold its own.